I am usually not one to spend a lot on guitar accessories. I buy strings in bulk and play with cheap plastic picks, for the most part. 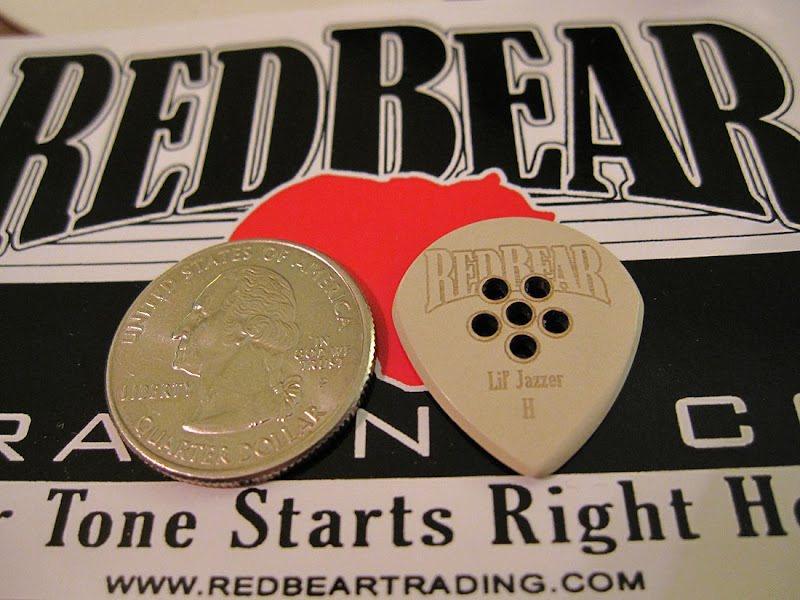 So a few years ago when I heard of the Red Bear Trading Co.'s $20 picks (yes, $20 each) I thought you'd have to be crazy to spend money like that on a pick. After doing a little research I discovered that they specialize in recreating tortoise shell picks (which are now illegal to make with real turtle shells) by using a material made from animal proteins. 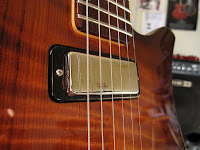 The result is a pick that plays and sounds exactly like tortoise shell, is legal to make and does no harm to turtles. Brilliant! These guys also have an impressive, and growing, list of artists playing their picks. Red Bear makes each pick to order, by hand, in nearly every conceivable size, shape, color and thickness. They also do custom orders with your name stamped on the pick, etc. And when they say "made to order" they mean it; there is no stocked inventory to pull from so it can take several weeks for your order to be fulfilled. Besides the simulated tortoise shell material, Red Bear now offers a new material in a line they call "Tuff Tones" for half the price ($10 each). This is the variety I ordered. The model I chose is the "Lil' Jazzer" with a heavy thickness (1.65mm) and added grip holes drilled into the center for better control. These things are pretty sheer and smooth, so if you are used to having some texture on your picks for grip, I highly recommend the grip holes option. Apart from the lower price, another thing that attracted me to the Tuff Tones picks are their durability. 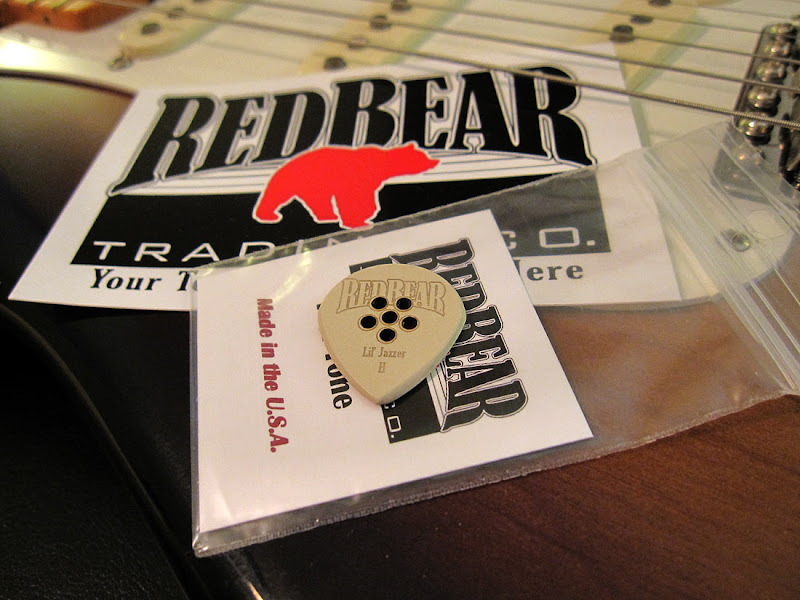 According to Red Bear, they are supposed to be as worry free as any regular plastic pick. The regular Red Bear line, on the other hand, can be a bit more fragile due to the material they are made from. 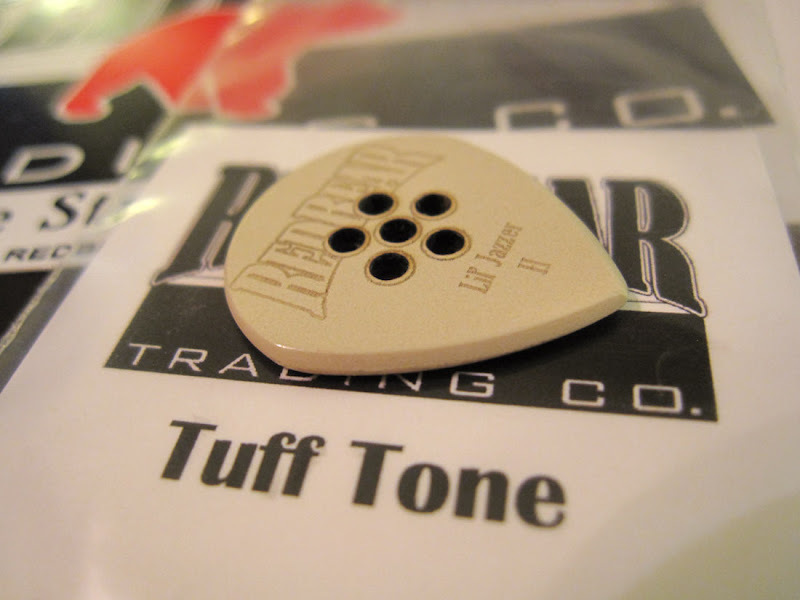 Apart from the pretty bland beige color, the Tuff Tone pick itself is a work of art. 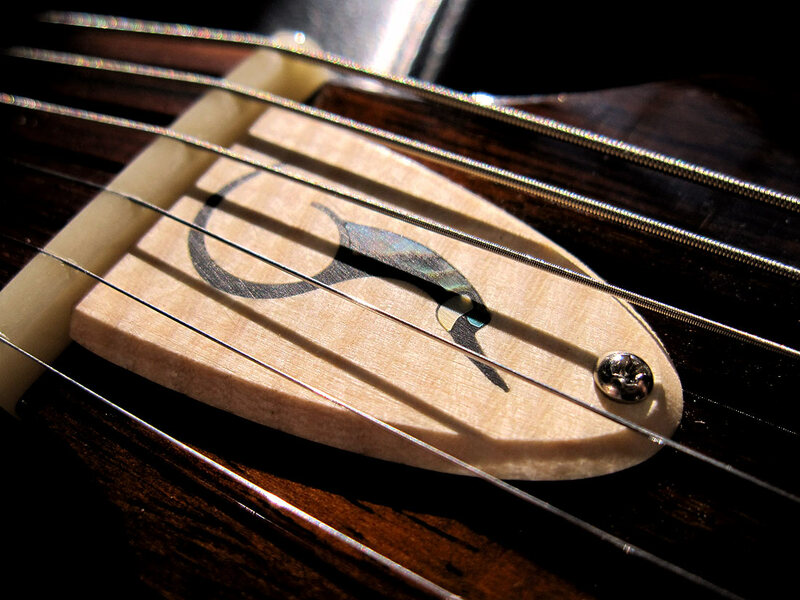 Beautifully cut and finished with a perfect bevel all the way around, each pick is also topped with a nice, clean logo graphic and model name etching. I ordered the standard bevel which is a basic bevel as seen on most picks... a "speed bevel" is also offered which is a more aggressive bevel sanded onto the edges where the pick hits the string near the tip. There is a right-hand and left-hand speed bevel option available. Now let's get to the real crux of what a good pick is all about: tone, playing action/feel and durability. Starting with tone, I'd have to say this is one of the best sounding picks I've ever tried with an electric guitar. The sound is full, round, warm and articulate... but not so warm that definition is lost. Quite to the contrary, there's a nice balance of highs and lows with this pick. Contrasted with my usual favorite, the Dunlop Jazz III, there is a lack of mid range muddiness in the Lil' Jazzer that I can distinctly hear in the Jazz III as I compare the two. 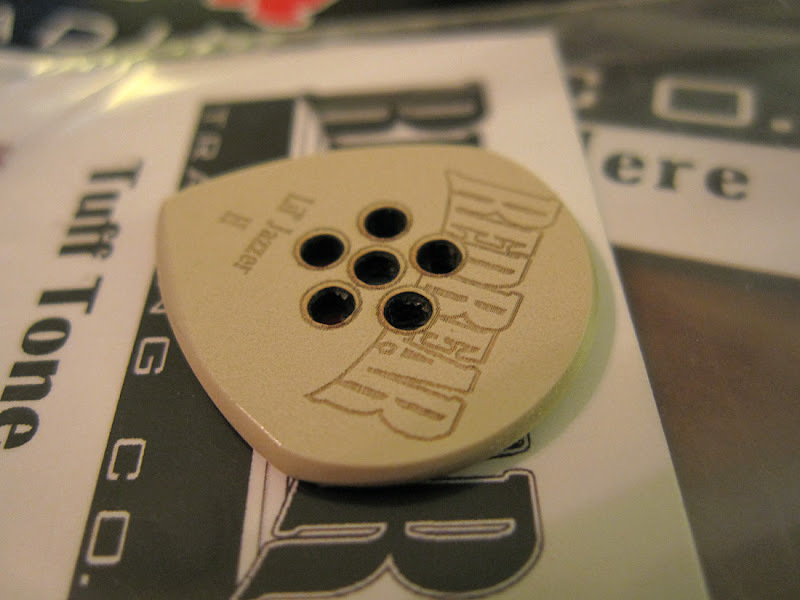 In terms of playing action and feel, this pick has a presence in your hand. It has a substantial feel between your fingers with each note picked; whereas the Jazz III feels thin and cheap by comparison. The Lil' Jazzer just glides over the strings providing a very smooth, snag-free playing action. Incidentally, this is the main reason I decided to check out these picks. I am in the process of switching my right-hand technique to the Gambale method (economy picking style) which requires a super smooth pick bevel to execute properly. 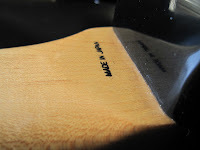 The way I pick causes the Jazz III's to eventually develop a rough edge after some use and requires periodic sanding to keep the action smooth. Plus, the Jazz III isn't the smoothest pick to begin with, so I figured the Red Bear might give me a small advantage with my new technique. Time will tell, but so far so good! My economy picking is much smoother with the Lil' Jazzer and the tone is fantastic. And finally, the durability factor. This one will take more time, as I just recently acquired the pick. I ordered the standard bevel and literally within a few days of playing the pick has developed its own "speed bevel". Hopefully this wear will level off and the pick will last a good long while. I have no idea how long it might last, but since I am now literally sweeping a large portion of my notes, the edges of my picks see a lot of action. In fact, most of the wear on my picks falls directly on the edges and almost zero on the tip. As I write this I have two more Tuff Tones Lil' Jazzers on order. One is the same exact heavy gauge thickness as the one being reviewed here, and the other is the same model in a medium gauge, which will be closer to the same thickness as a Jazz III. I'll report back once I get them and do a follow up review on which gauge, medium or heavy, works best for me and how good the long-term wear is. As for tone and playing action I can definitely give these a thumbs up! I feel like my tone path is finally complete... great amps, great guitars, great pickups, premium strings, quality cables and now a quality pick. If you are like me, you can't stand dealing with batteries or wall warts to power your pedals. I have a dedicated pedal board with integrated power for all the effects I use in front of my amp, but I also run a couple of pedals in my amp's loop that I keep close to the rig. 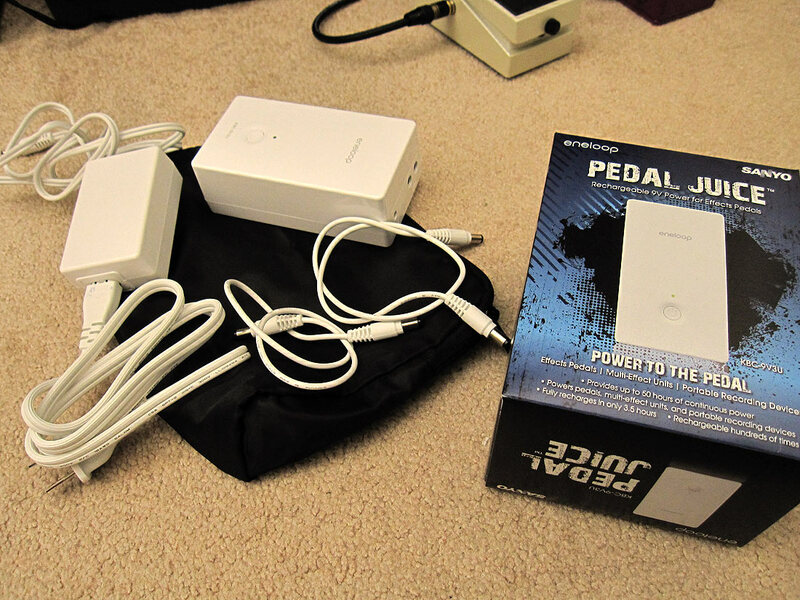 It's these two pedals that require wall warts or batteries... and that is where the Sanyo Pedal Juice comes in. What a convenient product this thing is! I was skeptical at first. I mean, 27 plus hours of playing time for two pedals on a single charge? It didn't seem likely until I charged it up and actually used it for a couple of weeks. After many practice sessions and a couple of jams this thing is still going strong. The Pedal Juice is basically a battery brick (3.7v lithium-ion) with two DC outputs that can power up to ten standard pedals (in order to power more than two pedals, one or more of them needs to have a power pass-through or you'll need a multi-plug cable since the Pedal Juice device only comes with two output cables that terminate in a single male end.) Sanyo claims that a single analog pedal using 10 mA will get about 50 hours playing time, a digital effect like a delay unit using 50 mA should get around 27 hours and a three pedal setup... say, a chorus, od pedal and a delay (with all three using something like 80 mA) should get about 20 hours of playing time. Pretty awesome! Build quality is superb. It is housed in an attractive, Apple Computers-like white plastic case that feels durable and looks great. The company claims it is water and shock resistant (great for the drunks that spill beer all over your stuff at gigs) and operation is super simple. There's a single power button and 3-stage LED indicator. You get a continuous green light when fully charged, then orange (30%-60% power remaining) to red (less than 30%) when it gets low. 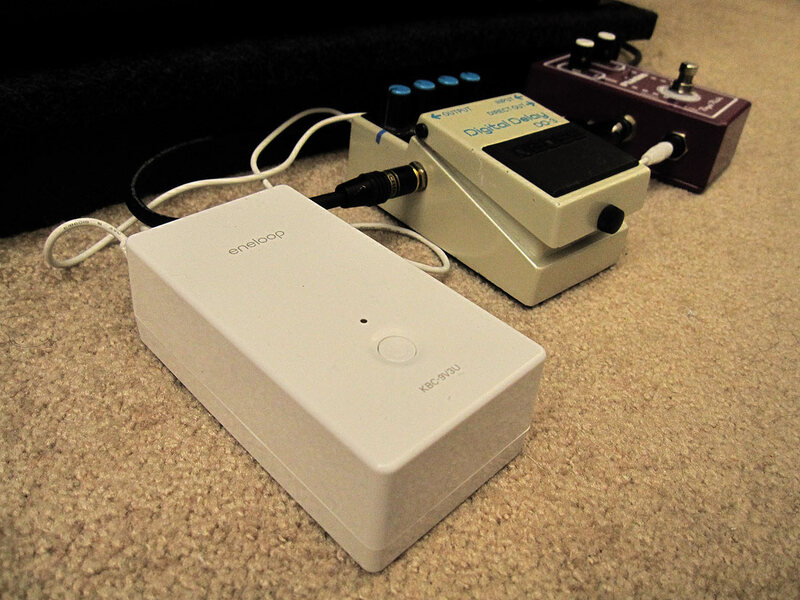 With over 20 hours of playing time for two pedals, this thing will last me a long time on a single charge and the best part is that I don't have to worry about AC power cords and the possibility of ground looping noise in clubs with less-than-stellar electrical wiring. 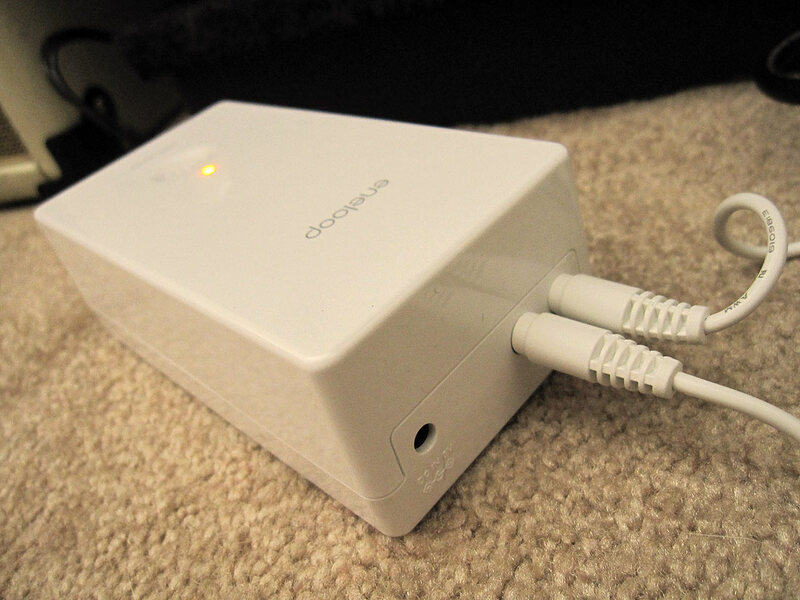 When both ports are in use they output 1000 mA each, which means you'll need to check your pedal's power requirements before using something like this and, of course, usage time may vary depending on those power requirements. Oh, and it only takes 3.5 hours to fully charge... which is actually quite fast for nearly 30 hours of up time! If you are interested in buying one they can be found at your local Guitar Center or Sam Ash store, and online. So far I am really impressed with this device and I plan to make it a permanent part of my rig. I highly recommend this product! Disclosure: This product was given to me by the manufacturer for review. This in no way influenced my opinion or review of this item. 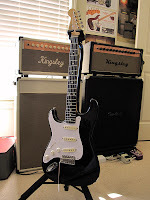 As I mentioned in my Weekend In Nashville post back in early September, I recently purchased an '88 black lefty '60s re-issue Fender Strat that I have restrung to play right handed. For years I've wanted a flipped "Hendrix" Strat, so when I started to look this one over I knew I had found what I've been searching for (and it's black, just like Jimi's number one!) The goal was to find a quality lefty for cheap and then fix it up... at $270 this guitar was a steal! 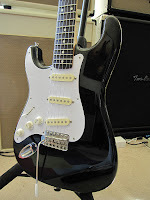 '80s Japanese Strats are often considered as good or better than the equivalent American version. Once I got the guitar home I immediately removed the strings, popped the neck off and tested the truss rod to see if it was still functioning properly (many times old guitars have broken truss rods that have been over tightened by people who shouldn't be working on their own instruments.) 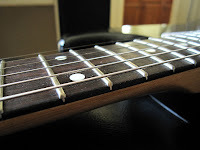 Once I verified that the truss rod was working I gently removed the nut, flipped it over, reinstalled it and slightly back filed the slots so I could finally test out the guitar strung right handed. I also set up the vintage tremolo bridge to float. The previous owner had 5 springs in it with the claw cranked down to immobilize the bridge. Leo Fender designed his bridge to float, and I personally feel that Strats play and sound better with the bridge set up this way. Of course, all of this was just a quick, down and dirty test to see if it was worth keeping. I was really impressed with the tone of this guitar! I knew it was a keeper within just a few minutes of playing time. 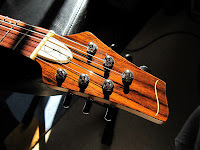 I played the guitar for about a week to see if I could accustom my right picking hand and arm to the knobs, tremolo bar and input jack being on top. This definitely takes some getting used to. Another caveat is the limited upper register access due to the top horn being further up the neck than the bottom one. Once I realized I could overcome most of these disadvantages I decided to move forward with having the fretboard re-planed to a flatter radius and having the neck refretted. I dropped it off at Joe Glaser's shop in Nashville where they took the 7.25" neck radius down to a more comfortable compound radius-- 10" at the first fret merging to a 12" radius at the octave. I opted for 6105 profile fret wire and provided the shop with my own favorite nut material, Stew Mac "slipstone" (delrin plastic.) 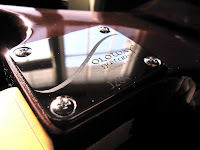 This material is excellent for guitars with non-locking tremolos. Afterward, it was given the full Plek treatment by Joe himself. The Plek ensures that all the frets on the neck have a balanced sound, thus eliminating potential dead spots. The result is a stunningly comfortable, highly playable neck and consistent tone all over the fretboard. I am now debating on whether or not to change out the pickups or leave the originals in there. The old pickups that are in it do appear to be the OEM set that came with the guitar. 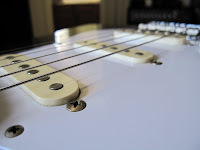 Of course, the 60 cycle hum is there and I've accustomed myself to the ultra quiet and great sounding DiMarzio Virtual Vintage pickups, which I use in all my other Strats. I'll need to do some further testing to decide, but so far I love the tone of the originals. Despite some basic wear and tear (far less wear and tear than you would expect on a 20+ year old instrument) the guitar is in superb condition. 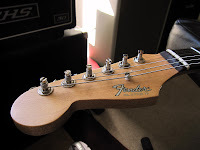 The only mods I've done (besides the neck work at Joe's shop) is to relocate the strap pin to the lower bout horn, replace the old eyelet-style tuners with a new set of lefty Kluson split-shaft tuners and install my treble bleed mod on the volume knob. Eventually I'll replace the strap pins with locking Schallers. I also plan on replacing the bridge with a Callaham narrow-spaced lefty vintage tremolo sometime next year when he gets another batch of them made. 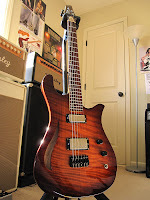 According to Mr. Callaham, his shop only makes one batch of these narrow-spaced lefty models per year. Can't wait to get one of those on this guitar! 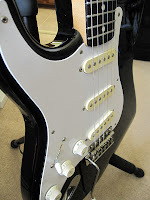 I am really excited to finally have a lefty Strat in my collection! And I am very pleased with how this guitar is coming together. I'll be sure to post a follow up when all the mods I pan to do are complete. Yes, it is true. I have a guitar problem. I can't seem to get enough of them and all the new and exciting builders that are coming out of the woodwork these days aren't helping matters any. 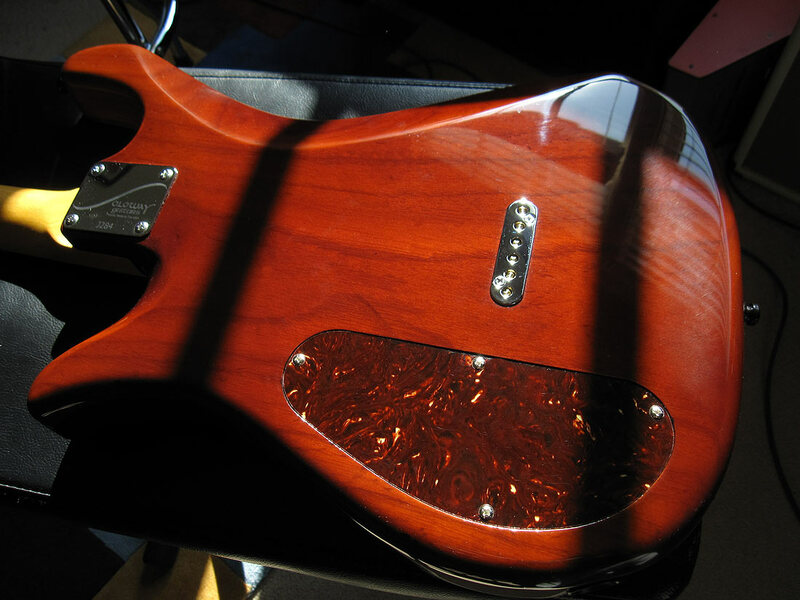 As I reported in my post on Soloway Guitars from the Nashville Amp Expo back in August, I ended up purchasing one of Jim Soloway's irresistible masterpieces. A gorgeous Gosling model donning a beautiful flamed redwood trans-burst top with Soloway-logo-inspired "f-hole"… once I saw it (and played it) I couldn't get my wallet out fast enough. From what I've gathered, Jim's been at this for about 8 or 9 years now and he's developed quite a fine product in the process. Fusing the design aesthetic of the Stratocaster with his own unique lower bout shape, Jim has produced a truly stunning new take on the classic Strat shape that most new builders rarely achieve. His first model, the Swan, is a semi-hollow body construction and is made from choice tonewoods (alder or ash usually) with all sorts of different top options available (maple, koa, redwood, and others). What is unique about the Swan is its 27" scale length. Though its scale might suggest it is a baritone, these guitars are strung and tuned like normal guitars. Jim claims the intonation of a 27" scale length guitar is far more accurate and the lows are much tighter and more piano like. Another thing you immediately notice is how light these guitars are. My Gosling weighs in at a feather-light 6.7 lbs! All of the guitars I demo'ed that day felt just as light. 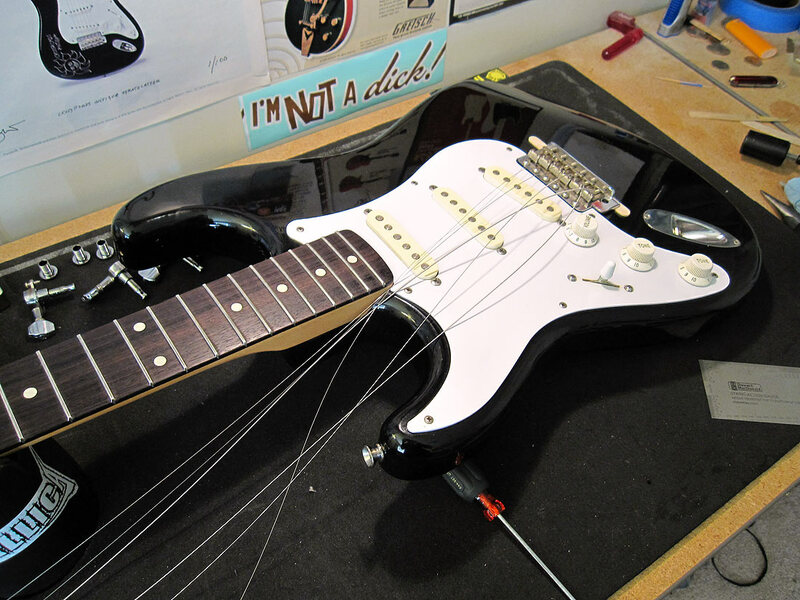 Jim is adamant about building light weight instruments after years of torturing his own lower back gigging heavy guitars. 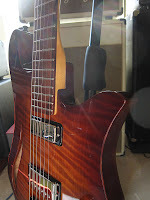 And despite the low weight, the timbre and sustain of these guitars is off the chart! Not even my heavy Les Pauls can keep up. Jim uses great hardware on his guitars. My Gosling is fitted with a Hipshot fixed bridge with Strat-style bridge saddles, some cool modern metal knobs with rubber gaskets fitted on them for easy gripping and some awesome open-back (yes, open-back!) 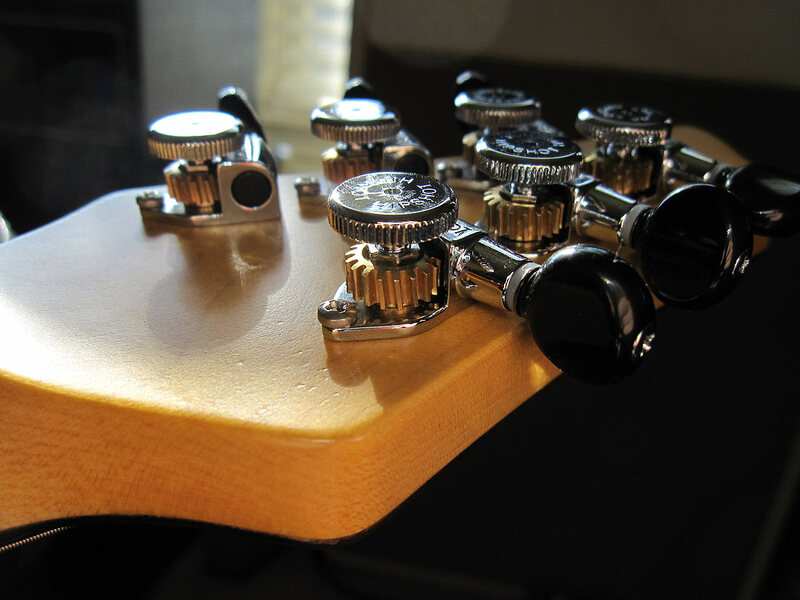 locking Hipshot tuners. 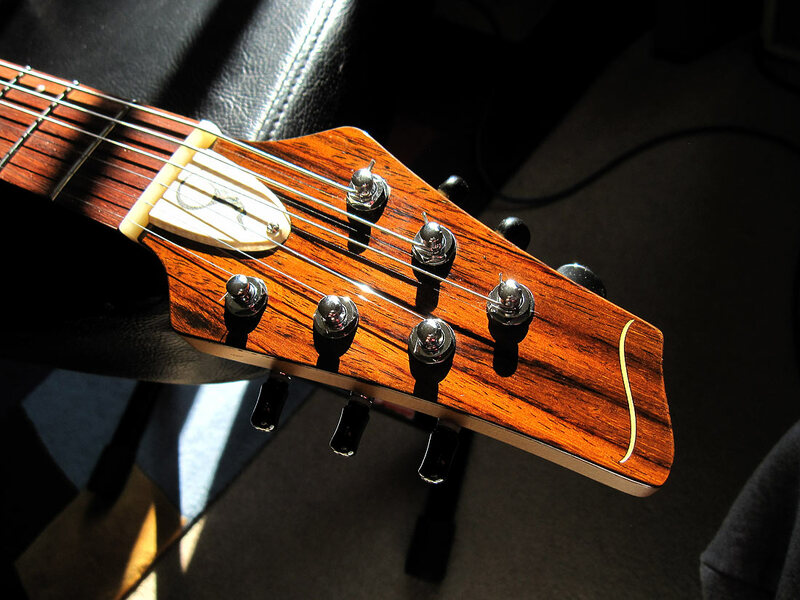 The guitar feels solid and stays in tune beautifully. 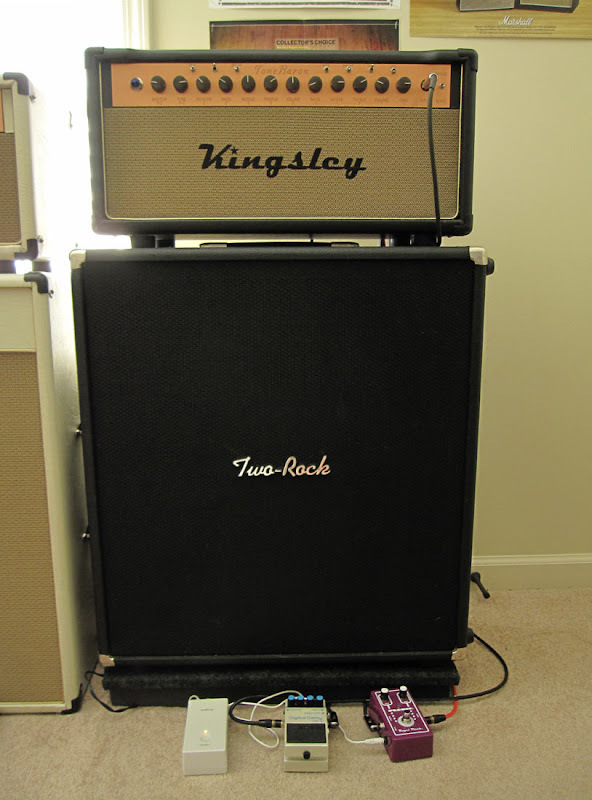 Plugged into my favorite Kingsley ToneBaron boutique amp rig, the Gosling just blew me away. 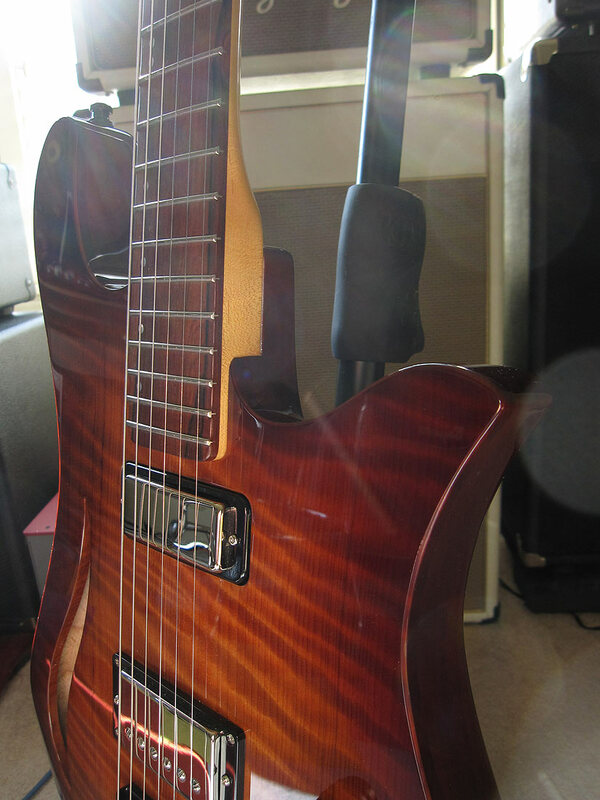 It is by far the clearest, most articulate guitar in my collection. 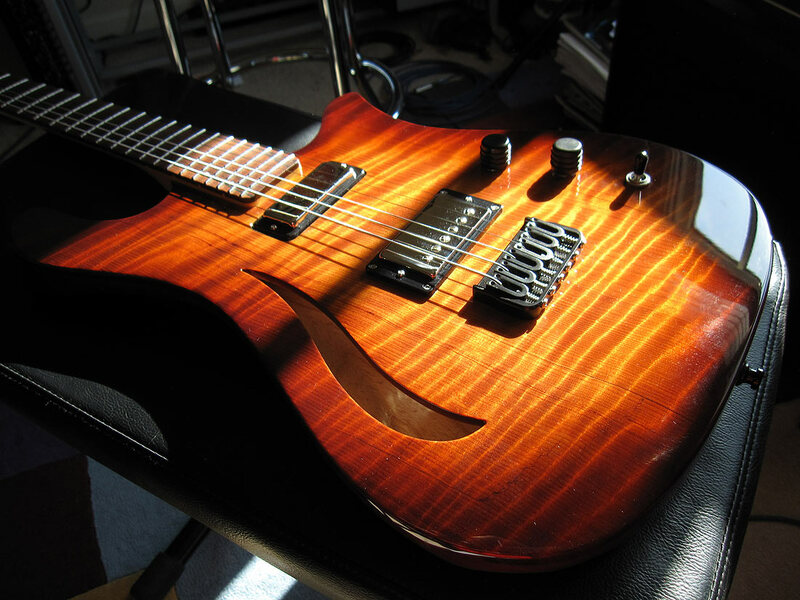 While I was easily able to get all the basic rock, shred, jazz and blues tones from it I can definitely see this guitar becoming my main go-to instrument for fusion stuff. 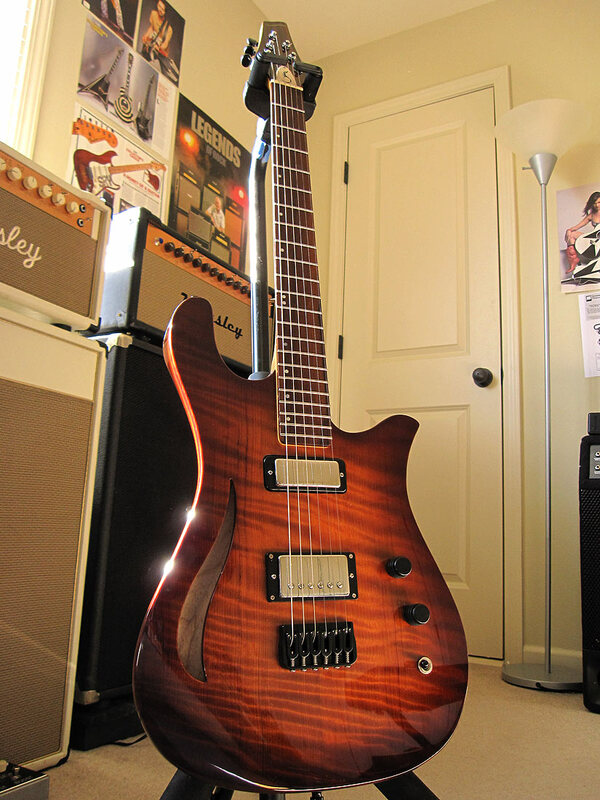 This particular build sports a DiMarzio 36th Anniversary PAF humbucker in the bridge position and a custom wound DiMarzio Firebird mini-humbucker in the neck (that was actually made for Jim by Larry DiMarzio himself). The electronics are wired with a 3-way selector switch, master volume and a push-pull tone pot that (when up) puts the pickups in series mode and (when down) puts them in the standard parallel mode. 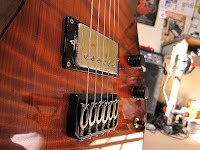 Pulling the push-pull knob up and engaging the series mode fattens up the tone so much that the bridge pickup practically sounds like a neck pickup. Couple this with the tone knob itself and different volume knob settings and a stunning plethora of sounds are available at your finger tips. With the Kingsley cranked under full distortion and the neck position in parallel mode with the volume rolled most of the way down, it was very easy to get a bright, Strat-like chime. 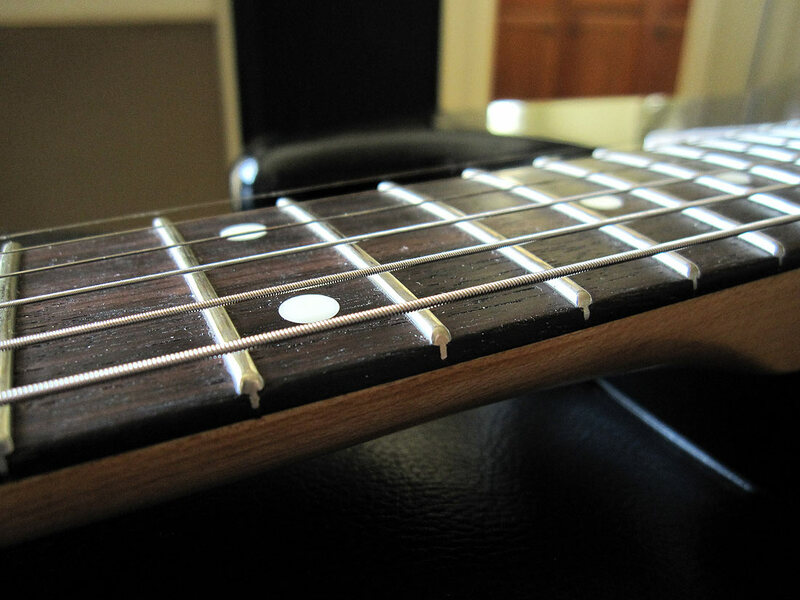 There's almost nothing this guitar can't do!